Today Elle had a couple of tests; a hearing test and an ECG. These are done because some of her chemo drugs can affect her hearing and her heart if they are not promptly flushed out of her system. She passed both easily. She especially enjoyed her ECG; she liked being able to see her heart on a screen. It was colored blue and red, which she though was top notch. But the best part for Elle was having the wires attached to her chest. She thought it made her look like a Transformer. A Transformer that turns into a princess (her words). And with that, I give you Elle the Transformer. It's been a quiet week. Elle's counts on her platlets and white blood cells were down slightly at the beginning of the week but had come back up by Thursday. Elle is scheduled for another round of the VAC in the hospital on August 3. That has pretty much been the only news of note for Elle as far as the cancer goes. But the big news is we're going to Boston to see the Red Sox! This is all thanks to Mike and Christine Paul, who made Elle the focus of their Ride and Rock fundraiser a couple of months ago. We're doing it up with a limo ride and everything. The kids are beyond excited and, frankly, so are Beth and I. It's going to be a blast. And yes, I promise to take (and post!) plenty of pictures. We got Elle's results from her scans this morning. And the news is positive. The main tumor, while still present, has continued to noticeably shrink. Some of the nodules that had formed on Elle's cavity wall have disappeared. And there has been zero spread of the cancer to any other part of her system. So to say Beth and I are happy with the latest news is an understatement. And while it's just one step in the long haul, it's a big one. 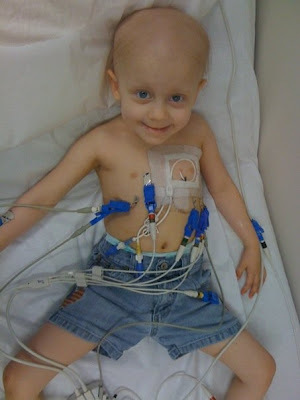 Now the question becomes whether we go one more round of chemo (VAC and Doxo/Cisplatin) or can we do surgery now? That hasn't been decided yet. If we do one more round that would be another two months of chemo. The surgical doctors will examine the scans and then we'll all get together to talk. So that decision is still a few days off, at least, from being made. But for now, we are breathing a sigh of relief and celebrating another victory for Elle. Yesterday Elle had her PET scan. As usual, she was a total pro. She didn't move a muscle and fell asleep while it was going on. The techs commented again on how great she was and compared her to athletes that freak out in the tube. In their defense, it is a tight tube. I'd probably spaz as well. But now we play the waiting game for a couple of days. And then we find out how effective Elle's chemo has been. That will dictate the next series of events. But for now Elle gets to relax...except for the daily filgrastim shot. Sorry, kiddo. Today and tomorrow are very important. 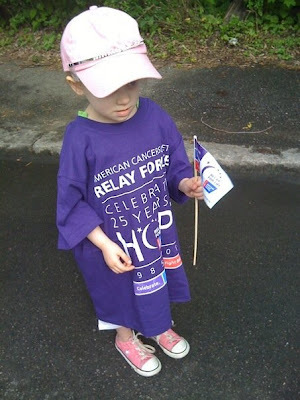 We are getting a series of scans done on Elle that will let us know how effective her treatment has been thus far. All the external signs have been positive up to now, so *knock on large piece of wood* hopefully the scans will prove the same. Today it's the CAT scan at MMC. Tomorrow is the PET scan. So pray extra hard for Elle today and tomorrow. The better the news, the better chance we can start surgery earlier and get this damned tumor out of her. Elle came home yesterday afternoon after finishing her second round of Doxorubicin and Cisplatin. She threw up a couple of times but it was nothing approaching "Exorcist" levels of spew. The bigger issue was all the pee she kept expelling because of the massive hydration that is required to flush these chems out of her system. Many pants were changed, my friends. And...Elle discovered a new fun thing to do in the hospital. You can unplug IV racks from the wall because they have a battery pack that keeps them running for a couple of hours. That allows nurses and doctors to transport patients without any worries about a drip stopping, or allows parents to walk their kids down to the playroom and then plug in there. Elle discovered a third thing it allows; riding the IV rack like a scooter as your dad pushes you. The bottom of the rack has two metal bars that cross each other and a wheel at each end. Elle discovered that she can hold the pole that holds the IV rack and place a foot on each of the bars. She is short enough that her head doesn't hit the stuff on the IV pole. So yesterday if you were at the Barbara Bush Childrens' Hospital, you saw me pushing Elle around the floor as she held onto her IV rack and yelled "Faster, faster!!" Since the nurses laughed at the sight of this nearly-bald, elf-sized girl riding her IV rack around the ward, I am guessing this is okay. Or it just may be because it's Elle and she can warp reality to her needs. Either way, she had a blast. So she is back home and demanding waffles. She is taking her Zofran but has thrown up once or twice since she got home. Again, nothing major but it is a side-effect of these particular chems. The Zofran does seem to be slowly lengthening the time between those moments, so hopefully it will kick in soon and stop the vomiting. And she wants to toast marshmallows tonight on the grill, so she must have an appetite of some kind. Next up should be some scans on Monday. That will hopefully set up the plan for going forward, including when the surgery will take place. Just a quick note to let you all know that Elle is going into the hospital tomorrow for her next round of doxorubicin and cisplatin. Her white count was up enough today that she is good to go. While Elle is in she's also going to get a transfusion. While she is still full of energy even with her lower red cell counts, the transfusion gives her more color and (God help us all) even more energy. If memory serves me right, Elle and Beth will be there until Thursday. And then they come home and the filgrastim shots begin. Which Elle just loves, as you all know. You may have heard that Miss Elle was recently in a parade. That she may have even been the star attraction of one group in the parade. Every year in the Biddeford/Saco area they hold "La Kermesse", which is a week-long Franco-American festival that has music, food, rides, activities galore and the aforementioned parade. 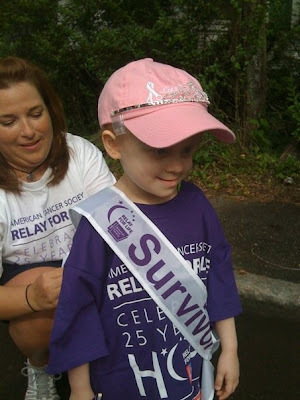 The Relay for Life / American Cancer Society had a float in the parade and they wanted Elle to be their special person. And so, of course, Elle became a parade princess. 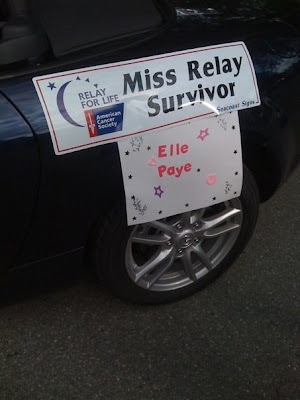 Specifically, she was "Miss Relay Survivor". Here is the sign that went on the side of the car. Elle got to take it home. I don't actually have any photos of the parade in progress yet. But as soon as I do I will post them. Suffice it to say, she was a great float rider, waving to the crowd and winning them over with the total package of cute that is Elle. 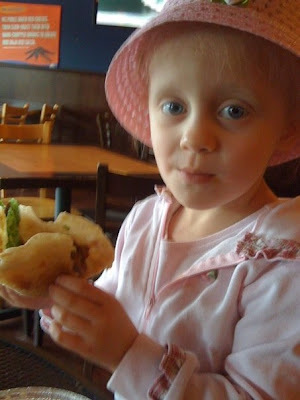 So, until then, here is a bonus photo of Elle eating a taco at Costa Vida in South Portland. Enjoy!